That’s a dangerous concept. As a kid, I would wake up in the middle of the night convinced that Frankenstein was outside the door, ready to get me. Who knew I was making him real the whole time? Wiki tell me Douglas Adams (pbuh) also played around with the idea. 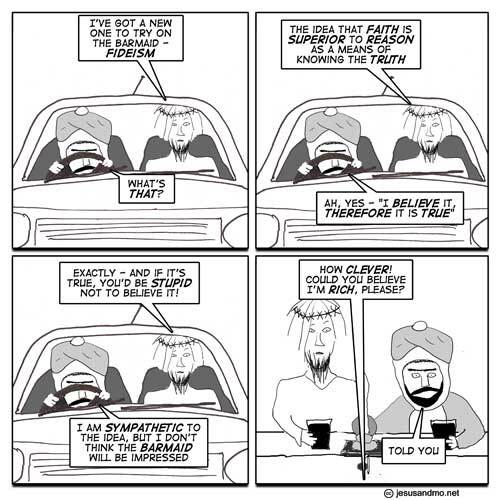 The steering wheel blocking Mo’s vision is a good example of faith being superior to reason, sort of like giving the keys to Stevie Wonder and asking him to drive the car because you’re feeling a little tired. If Jesus is supposed to be omniscient, why didn’t he see this coming? Well He’s got that wilful suspension of disbelief and wishful thinking going so well that He can easily pretend He doesn’t know exactly what His future is. Something like that. Of course, given that He doesn’t exist and probably never walked this Earth, it’s really our wilful suspension of disbelief that allows us to consider him as an entity. Ooh, I think someone let Jesus in on The Secret! JohnnieCannuck! Surely, its the divinity of Jesus that’s up for questioning, not whether or not he actually existed. 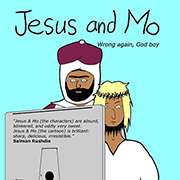 I guess author has got him taking a lead from the general religious population on earth. I think we should all take care not to turn atheism into another bigoted religion. Odd, too, that Jesus didn’t know there were no figs on that tree, and didn’t even know it was the wrong season for figs. That’s rather ungodly! The boys are confused between subjective and objective reality. A common mistake of the fundamentalist. But, since they were dropped on their heads when they were babies and lost the functionality of their logic centers, it isn’t likely they will ever understand objective reality. Wilful suspension of disbelief! Now that’s funny! Given that the object or criteria for that which you believe is valued as a source for truth, then surely faith (in that object) is a valid means of knowing truth. Jesus has no purpose or impetus for believing Barmaid to be rich, so why should he? Fideism, as generally understood, is not about the superiority of faith to reason, but about the superiority of faith to reason on certain topics, like the existence of God. 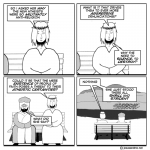 Fideists (unlike Jesus and Mo) know the “rational” arguments for God’s existence are no good, but they choose to believe in him anyhow. Martin Gardner and Winston Churchill, hardly among the world’s bottom 10%, are and were fideists. My take is that there is no evidence for the existence of any god, triune or not. Likewise there is only the unreliable testimony of a holy book that a man who may have been named Yeshua lived. I fail to see how any of the more spectacular miracles attributed to him could have possibly been ignored by the Roman writers of his time. People rising out of their graves at his death really should have attracted a lot of attention. I mean, a guy marries a widow and all of a sudden her old husband is at the door wanting to take up where he left off? Big fuss. And the murder victims making accusations? Big fuss. Care to explain how my comment was bigotted? I prefer to wait until someone, Christian or not, does something evil before bad mouthing them. Don’t take the car to the pub boys and girls. often we hear, “I’m OK to drive!” One well-lit friend even said, “Oh, have a little faith.” He got away from us, but he did make it home, so I guess he was right. I haven’t made that mistake since the locomotive knocked me off the 300-foot cliff into the raging river. NO!!! FOR CRYING OUT LOUD THINK WHAT YOU ARE DOING??!! DON’T YOU REALISE THAT FIDEISM IS THE BASIS OF OUR ENTIRE ECONOMY!!!! That’s what is wrong with the world today, it’s people like the Barmaid misusing fideism to get rich quick at the expense of true believers. Plus, Poor Richard, you have an office cat? I want to work where you work. Whoops, sorry Johnny Canuk, I didn’t mean your comment was bigoted, I should have punctuated better it wasn’t supposed to run quite so together as it appeared. My comment was aimed to question your implication that the guy called Jesus, Yeshua etc didn’t exist. Whether or not the magic actually happened is another subject. The comment about bigotry was more general, there seems to be a tone developing overall here, that is a bit exclusive and maybe leads to the same melting pot of religious bigotry we find with all fundementalists. Well, I guess in the absence of any reliable evidence, one should not make any strong claims for existence or non-existence of a physical man. On that specific subject I can claim to be agnostic. Maybe there was an otherwise unremarkable man around whom rumours and claims began to swirl until people started to build a legend around him. Perhaps there were several such stories about different men that were merged. Certainly the Mithras legend was folded in. Ancient prophecies came to pass by the simple expedient of making stuff up, to fit. If doubting all of the magic stuff, from Immaculate Conception through Ascension is reasonable, how does doubting that the mundane 5% remaining, crosses a line and is unacceptable? Sort of weird Jesus character setting up a straw man to blow down, re: faith. John makes it clear that crowds STILL did not believe Christ 2 B God even after they saw ALL HIS MIRACLES, just prior to his death, though many came to see risen Lazarus during Jesus’ final trip into Jerusalem, a man raised from the dead in presence of many eyewitnesses. So many in fact, that chief priests ALSO decided to execute Lazarus, because his presence was such an aid to FACT BASED BELIEF in Christ. So, Jesus showed that 3 years of SCIENTIFICALLY VERIFIED and witnessed miracles still did not overcome our aversion to believing there is a personal God with whom we deal. I note Mo always drives. It’s clear who’s wearing the trousers round here.